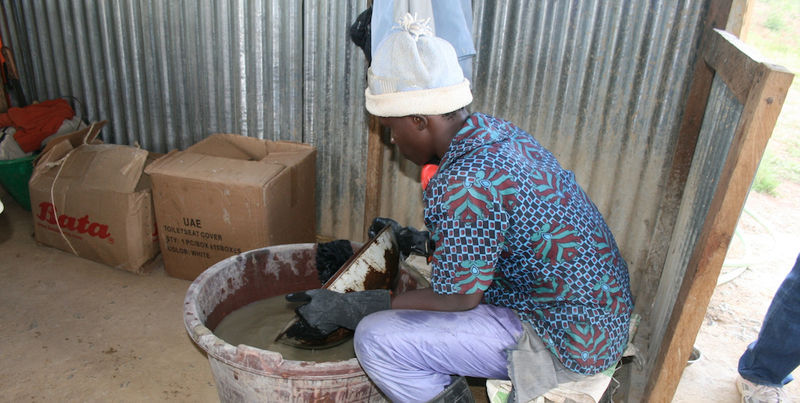 Here, a Kenyan small-scale miner on the path to Fairtrade uses protective gear to prevent mercury contamination. Mercury is a dangerous neuro-toxin. Small-scale gold mines are one of the major contributors to global mercury contamination, but with Fairtrade mercury is recycled and does not go out and contaminate our environment. One day, US Fairtrade Gold jewelry will have a massive positive impact on the fifteen million small-scale artisan gold miners who live in poverty and exploitation. The US is the largest jewelry market in the world. When Faitrade Gold becomes as popular as Fairtrade coffee or chocolate in the market, it will change the lives of hundreds of thousands, or even millions of small-scale miners around the world. Yet for now, after a year of finally becoming certified as the first US Fairtrade gold jeweler, trying to set up a platform for this change has been a hard wrought process we have been involved in for about a decade. Fairtrade Gold pioneering efforts started in the UK in 2002, with the work of Greg Valerio who founded Cred Jewelry. He was the first jeweler to obtain gold from a small-scale mine in Columbia. This gold was mined without chemicals and completely by hand. We joined Greg’s efforts in 2006 and after much hard work, in February of 2011, certified Fairtrade gold was introduced into the UK market. Even before that historic date, I was working on creating a business plan with Fairtrade to Fairtrade Gold in the US, but there were challenges outside our control. Due to the split between Fairtrade International and Fairtrade USA, the formal introduction of Fairtrade Gold through a jeweler-certification strategy was delayed. Fairtrade International had to reestablish their own organization in the US, despite our best efforts. Though we had been using Fairtrade gold in 2011 outside of any certification process, we became the first Fairtrade Gold US jeweler in the momentous month of April 2015. A non-labeled mass-balanced market for larger volume businesses. The small jewelers scheme - an unlabeled registration strategy for the bench jewelers and startups who purchase less that 500g of gold per annum. The second caveat is particularly important in context to small-scale jewelers. As the only Fairtrade Gold US jeweler, I am especially aware of the associated cost and administrative burden in opening the Fairtrade gold market for any and all small jeweler. Particularly at Reflective Images Jewelry, the upstanding burden of introducing Fairtrade Gold into our supply chain has been extremely difficult and costly. Small pioneer jewelers are critical to Fairtrade Gold, since they are driven by principal and work closely with the customer in order of marketing. Also, small-scale jewelers create the incentive for large supply houses to stock Fairtrade gold mill products, such as gold sheets and wire, which are needed to fabricate jewelry. Without an easy strategy for small-scale jewelers, who represent the bread and butter of large supply houses, large supply houses would not join in. The growth in the volume of Fairtrade Gold, since the 2013 introduction of the above business models, has come about as a result of an upturn in the participation of the strategy by small-scale jewelers and their supply houses. Surprisingly, the growth has not come about as a result of large volume brands buying into the scheme, but rather by small-scale jewelers. This focus on small-scale jewelers is reflective of the jewelers market itself, a market that is made up of 70% small independent family run retailers. This growth demonstrates that Fairtrade has the correct models for the product itself and that jewelers are willing to participate, as the conditions are right. This in turn has seen year on year increases benefit the small-scale mining. As the first US Fairtrade Gold jeweler, I am working hard to find ways to make it easier for future and current jewelers to follow my lead.